Starting this Friday, there’s a new event in town. 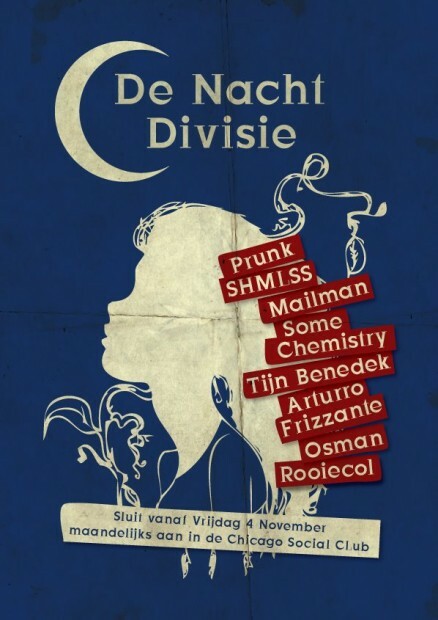 De Nachtdivisie welcomes you to Leidseplein’s Chicago Social Club every first Friday of the month. What’s in a name? A collective of up and coming DJ/producers from Amsterdam that represent the contemporary grooves and deep sounds of our town. Who are these local heroes we’re talking about? Prunk, Arturo Frizzante, SHMLSS, Mailman, Some Chemistry (that’s me), Tijn Benedek, Osman and Rooiecol. As a wise man once said: ‘support your local scene’! If you ask me, this event should’ve been named ‘Studio 80 invites Einmusik and NU’. It’s all very nice to see DMZS again, but both Einmusik and NU are, in my opinion, strongly underrated German producing geniuses. Einmusik plays live from 1.30 to 2.30 in the main area and NU’s live set kicks in at 3.00 right after Rus in the second area. Ah, Edu Imbernon is back in town. We really enjoyed co-hosting Edu’s special showcase last time he was in town. Remember? This time around, Midnight Freaks invited Diynamic’s Uner to shine next to him. Support is by Freddy Spool and Ferro amongst others. I wonder where the afterparty for all these Friday night events will take place… Let me know if you know! On Saturday, it’s time to celebrate the 10th edition of De Nachtspelen. Get your most colourful leggings and wristbands out of the closet for this year’s ‘Wintergames’. Yes, it’s all about world records and challenging your way into the Guinness book of ehm.. healthy partying. Line up? Who cares, tech house, chicks in sportswear and team spirit! Amsterdam will be filled with culture and art lovers this Saturday night, due to the Museum Night. Lots of people will have the urge to go out and get drunk after al this cultural enlightenment. One of the events that will combine art and clubbing, is the Curious After N8 at Leidseplein’s Sugar Factory. Expect lots of surprises like Curious Avatar and Curious Ceiling and performances by Palmbomen, Daniel Zuur (live) and Carlos Valdes. Another party you seriously might want to consider after visiting Museum Night, is Belchique’s nachtmuseum editie, by and Spacegirls. De Kring, named ‘new beat’ for the night, will dance to the BPMs of Mark van de Maat, Frankie D (RoXY) and the new phenomenon called SPACEGIRLS. Club Up will feature Rutger Docter, Uptight Ed & Dave Hagen and Sven Prinsen. Dresscode: New wave&beat, holders of a Museam Night wrist band pay less at the door. Finally, Trouw’s loyal residents 360 call it quits on this night. No, 360 do not break up. Neither do they end their Trouw residency. The men behind 360 decided it was probably time for something new after throwing their own minimal techno nights since march 2006 at the legendary Club 11. Of course, they want to go out with a bang. Patrice Baumel and Nuno dos Santos invite you to bring the house down one more time, for old time sake. 360 will rock the upstairs room all night long and their friends from Optimo will let the sweat drip off the walls for n8’s after party in the basement. Have a pleasant hangover Amsterdam!